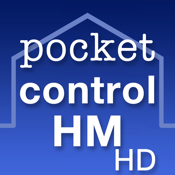 Pocket control HM for iPad enables you to operate your HomeMatic home automation system of eQ-3 AG from your iPhone or iPod. 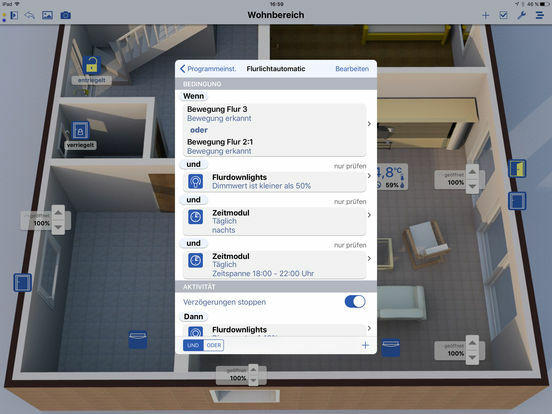 Lighting, heating and other devices can be controlled directly or through defined actions. 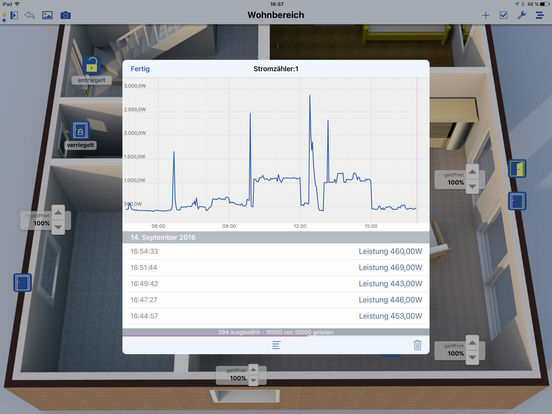 Security state, open windows, temperatures and weather data are displayed in an easily understandable way. Communication is provided via WLAN (WiFi) when at home and via an existing VPN connection when away. For the use of pocket control HM iPad a CCU is necessary. - Device data (names, channels, current state, system variables and programs) are read directly from the HomeMatic CCU. - When starting the app the first time the address of the CCU is entered. HomeMatic CCU query takes 3-4 seconds. Then pocket control HM iPad is ready for use. - Several configurations can be generated (several for one or more systems). 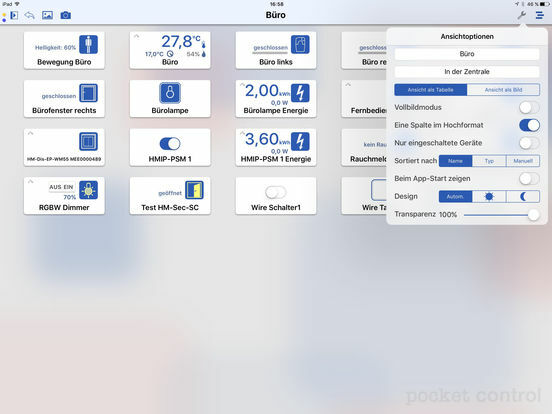 - You can change device names that are stored in the CCU directly in the app. 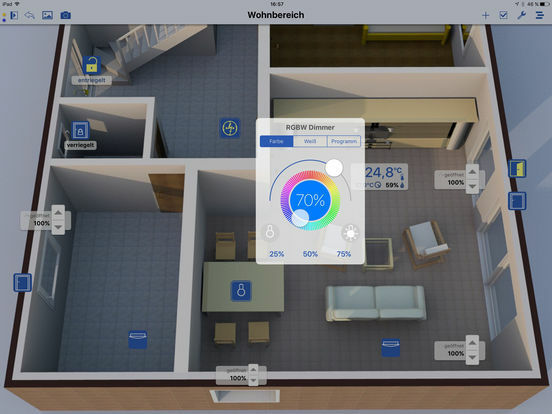 - The wireless and RS485 components of your HomeMatic system are supported. - For operating the system remote controls and wall switches are modelled graphically. - You can define custom views for certain devices in order to access them quickly. - The views can be provided as a table or as a picture view. Picture views have a background picture and manually or automatically positioned devices. Thus you can serve in a ground plan or a photo the devices intuitively. - Self-generated actions enable you to change the state of several devices in one go. - Service messages are listed and can be confirmed. - Programs of the CCU can be started, created, modified, and deleted. - System variables can be displayed, added, changed, and deleted. - A connection to the service meine-homematic.de is integrated. - Webcams can be integrated.